Pimelometopon pulchrum: The California sheepshead ranges from Monterey Bay to the Gulf of California with the largest populations in the lower half of the range, south of Point Conception. It is usually caught at the edges of kelp beds and rocky shores where its main diet consists of mollusks, lobsters, crabs, and small fishes. It is not related to the sheepshead of the Atlantic coast and the Gulf of Mexico. And, even more important, it is mightily tasty! Link to more information on the California Sheepshead. 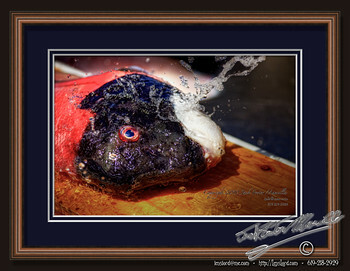 This entry was posted in Animal, Fauna, Fish, Purchasable - As Art Prints, Sea, Ships, Water. Bookmark the permalink.